By 1876, a similar service was also available from the White Hart Hotel in High Street. At this time, the Railway Station was further North than the existing station and the single line ran from Derby to Hampton-in-Arden where it was possible to connect to the London and Birmingham Railway. 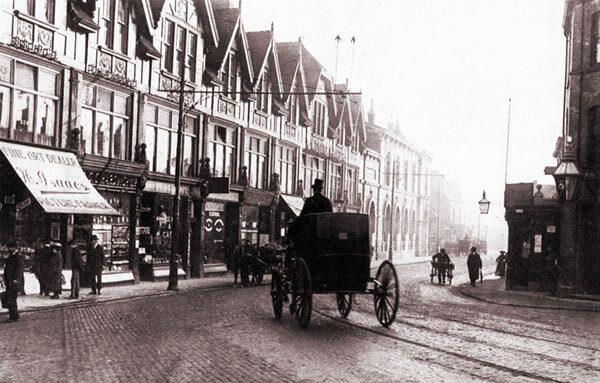 In 1880, still a few years before the ‘new’ Burton Station was built, William Marriott, Cab Proprietor, ran the first two-horse service from Stapenhill Green (close to Saint Peter’s Church), to the station via the Trent Bridge four times a day for the rather steep price of fourpence, though this was well before the Ferry Bridge and viaduct had been built so the alternatives were a long walk or penny ferry crossing followed by an often muddy trek across the meadows. The price however, proved to be inhibitive and the venture failed. Another service between Horninglow and the Market Place also proved to be unsuccessful at around the same time. In 1887, a Mr John Wilkinson of Stanton Road established a successful single horse service from Stapenhill Green to Burton Station assisted by the facts the the fare was a more affordable twopence and the new station now ran over four times as many trains. By 1900, he was also running a service from the Derby Turn to All Saints Road. Services ran hourly; half hourly at the busiest times. Horse drawn fixed route public transport was proving a successful alternative to hansom cabs, the forebear of taxis, which could cost as much as a shilling (twelve-pence) a mile. The growth of services prompted the passage of bye-laws for their regulation. 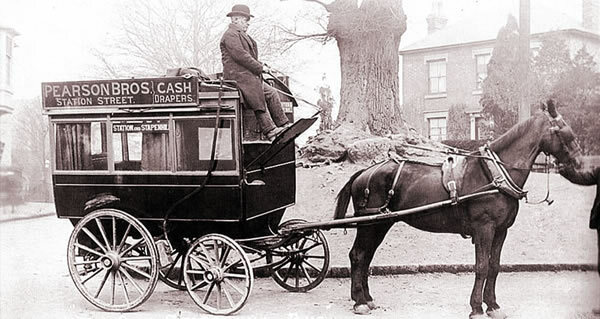 The top photo of Wilkinson’s Bus taken around 1896, shows that advertising on the side of public transport is far from new with Pearson Brothers, Cash Drapers based in Station Street, being keen to offer sponsership. The service was eventually bought by Nutt and Company who were running a service between Winshill and Burton Station. This turned out to be an astute move and Mr Wilkinson had likely correctly predicted the competition from a proposed tramway system. Though the tramway saw the end of the horse-drawn omnibis, the Hanson cabs continued to service parts of the town not accessible by tram and to transfer people from the station as the above romantic picture shows as a cab defiantly makes its way across the tram tracks.